Senate Bill 2720 (Comprehensive Nursing Law of 2015) which sought a P24,887 basic pay for nurses has been approved on third and final reading. Senator Antonio Trillanes IV, chairman of the Committee on Civil Service and Government Reorganization, who sponsored the bill, said the measure intends to "expand the scope of nursing practice to encompass not only the nursing education service but also research, and leadership and governance, as inherent areas of the practice." "Due to the growing number of nurses in the country, some are forced to work under job order or contractual terms or seek better opportunities abroad because the government fails to address the needs of their profession," he stated. Trillanes said the situation must be changed, given that Filipino nurses are widely recognized as "among the best healthcare providers in the world. Our nurses' skills and brand of service are very much recognized and sought abroad". He said improving the country's health care system "is one of the keys to a stronger and healthier citizenry which is vital in the improvement of a productive population." According to Trillanes, the new bill provides for the creation of a Nursing board composed of seven members who may serve for three years. The members of the Nursing board shall be appointed by the President of the Philippines upon the nomination of the Professional Regulation Commission (PRC). Trillanes said the proposed measure would enhance the powers of the Board of Nursing by including the power to create task forces/ committees and offices to better organize itself and facilitate its function and pursue its programs." The bill also provides a minimum base pay which shall not be lower than Salary Grade 15 (P24,887) for Filipino nurses in both government and private health institutions. "The enactment of this measure is intended to complement the talent and competence of our nurses by providing them with an updated regulatory framework," Trillanes said. 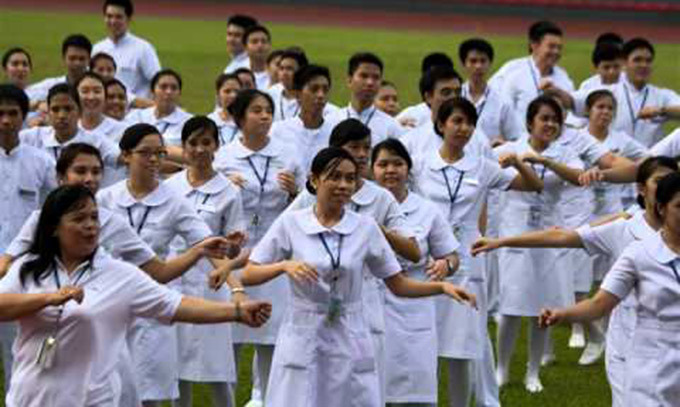 Senate President Franklin Drilon said the enactment of SBN 2720 into law would "help upgrade the country's nursing profession and sustain the Philippine's leading role in the health-care labor market, and address its most pressing issues, such as unemployment and misemployment of Filipino nurses."